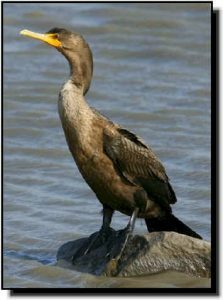 Comments: Double-crested Cormorants are common throughout the Great Plains. During the breeding season they develop small crests along each side of the head. Their gular pouches are always yellow-orange and are rounder than the Neotropic Cormorant’s. Young birds are browner than adults and have white under the neck and chest. Occasionally, the gular pouch may be tinged with white causing them to be confused with Neotropic Cormorants. In flight, the tail is noticeably shorter than a Neotropic Cormorant or Anhinga.